Alfred was born in Newbury on 16 December 1882 the son of William Garrett and his wife Emily née Kingh. When his parents filled in their census form in 1911 they included the information that they had six children, five of whom were still alive. The identity of the deceased child cannot be determined without significant expenditure on death certificates because there are several possible child deaths in the Newbury area during the period when William and Emily were having children. Alfred’s surviving siblings were Thomas (born 1879), Ellen Kate (1881), Frederick George (1885) and Daisy (1887). Alfred was educated at St John’s infant school and Newbury National Boys School (St Nicolas’ in Enborne Road). 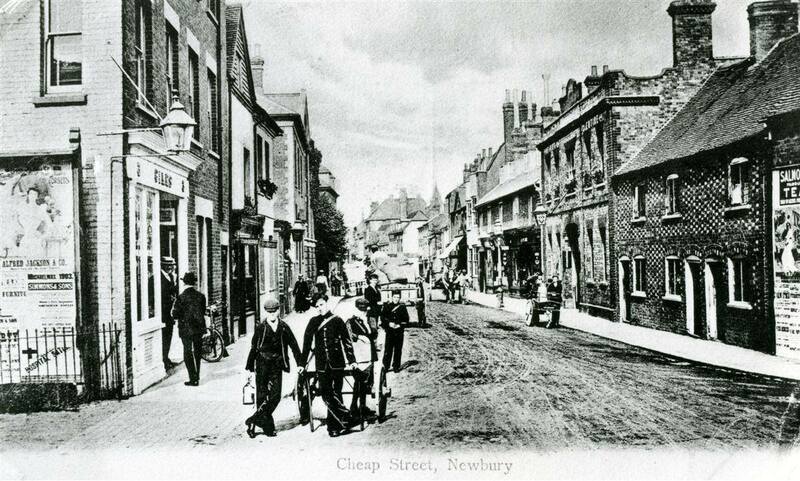 The family lived at various addresses around Newbury, including Old Newtown Road, Hampton Road and Gordon Terrace in King's Road; by the time war came they had settled at 13 South View, King's Road - now 98 King's Road. Alfred left school on 21 December 1894, a few days after his 12th birthday. He started work as a Gordon Boy; the Gordon Boys organisation was run on pseudo-military lines with the boys dressed in uniform. Anyone wanting an errand run or some small unskilled job undertaking could hire a boy for the purpose. However, this was not the path to a career, just a temporary expedient if the lad could not find full time employment. Before long Alfred moved on to a job with prospects when he went to work for the General Post Office. 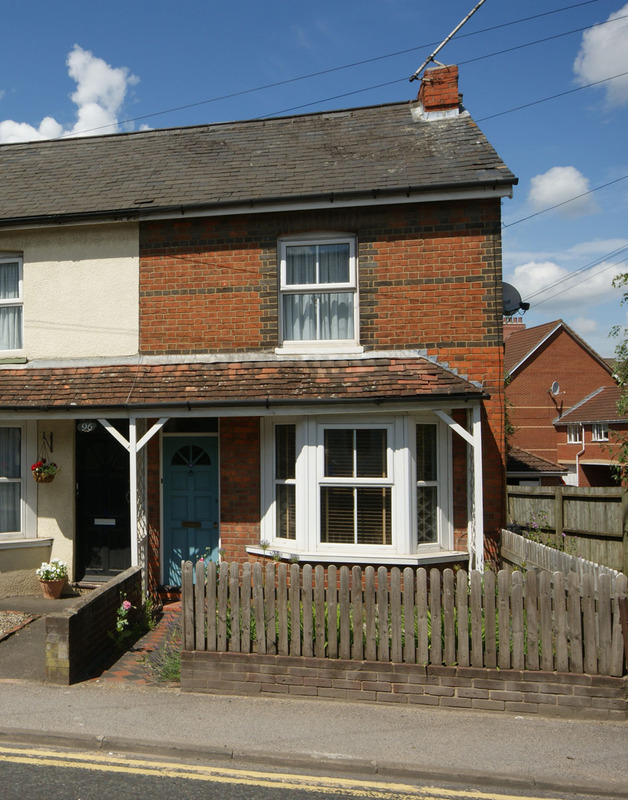 He became a telegraph engineer – the 1901 census found him with a party of engineers in Eling in the New Forest – quite possibly installing telegraph/telephone lines. By 1911 he was in Weymouth and working as a telegraphist while boarding with Rose Bullen and her daughters. A second boarder was his cousin Richard Kingh, several years Alfred’s junior he was also working as a telegraphist. Alfred seems to have volunteered shortly before conscription was introduced; possibly via the Derby or Group Scheme in late 1915 – which allowed men to attest (sign up) and then return to civilian life until called by in their Group (based on age and marital status). Whichever route he chose he donned his uniform in March 1916 and was posted to the Oxfordshire and Buckinghamshire Light Infantry. In many ways this is a surprising posting – his skills would surely have been in demand in the Royal Engineers, the Corps that ran the communications infrastructure on and behind the front. He first went to France with the regiment’s 2/4th Battalion. This Territorial battalion went overseas in May 1916 – too early for Alfred to have completed his training, so he must have joined the battalion at a later date, probably towards the end of 1916. As a Territorial Alfred had the regimental number 7077. Since his record did not survive the fire in 1940 which destroyed around 70% of WW1 soldiers’ files, it is not possible to add any real detail to Alfred’s time in the Army. What is apparent is that he changed from the 2/4th to the 6th Battalion of the Ox & Bucks Light Infantry. Because he moved from a Territorial unit to a Regular army unit (albeit a Service battalion) he was given a new regimental number (33312). Changes like this usually came about because of a break in service – most commonly a stay in hospital occasioned by a wound or sickness. On recovery the man would be sent to whichever unit was most in need of reinforcement. It is possible that he did not join the 6th Battalion until August 1917, after it has suffered significant losses in the Battle of Langemarck. 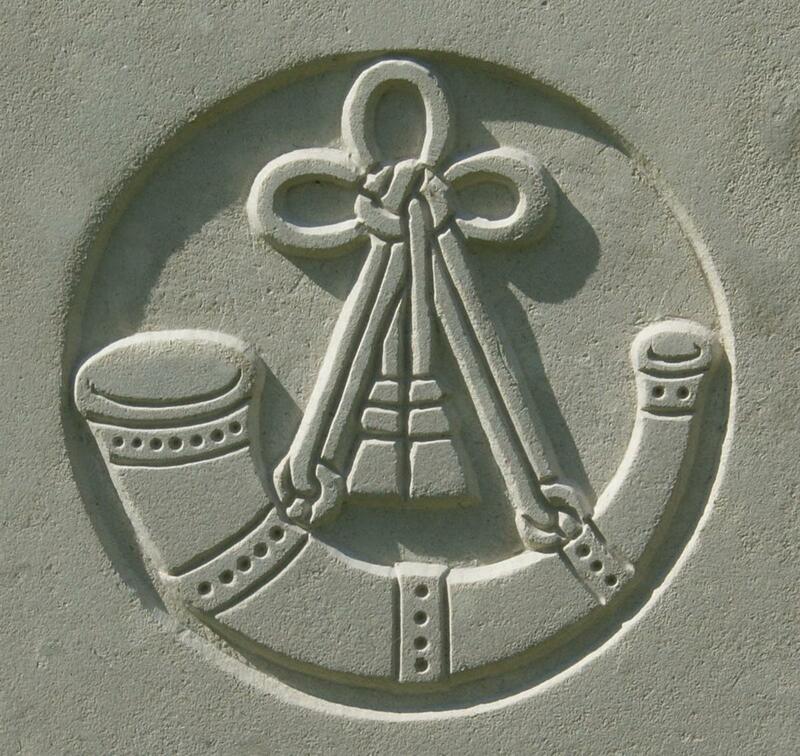 The regimental badge of the Oxfordshire and Buckinghamshire Light Infantry, as used on CWGC headstones. On 20 August the battalion took part in the Battle of the Menin Road Ridge – this was the third general attack of the overall 3rd Battle of Ypres (commonly referred to as the Battle of Passchendaele). In the Battles of Pilkhem Ridge and Lagemarck the British had not made much progress, so Haig transferred command of the offensive from General Gough (5th Army) to General Pllumer (2nd Army). Plumer’s tactics were different, confining attacks to limited objectives in a step by step approach to the objective – the capture of the Gheluvelt plateau. The first step was the capture of the Menin Road ridge. 5.40am on 20 September 1917 was zero hour for the assault – within a couple of hours almost all objectives had been taken. By the time the Germans mustered resources for a counter-attack the British had dug in and were ready for them. The 6th Ox & Bucks took part as part of 20th Division (60th Brigade). The Division had the responsibility of being the northern flank of the advance and had a far harder time of it than most and were unable to reach their objectives. B Company (2nd Lieut. Mitchell) holding front line U.23.d.7.4 to U.23.d.4.5, with two platoons. H.Q. andthree platoons round Double Cotts (U.23.d.3.8). Battalion H.Q . at Au Bon Gite. The 19th September was quiet, except for a little hostile shelling. That evening, as soon as it was dark, and companies had got their rations, they moved forward into assembly positions, which had all been taken up by 2 a.m. (20th). A Company lost 10 men in moving up, otherwise there were no casualties in the Battalion. The disposition of companies was now: A left, C centre, B right, D reserve. Each of the three front companies formed up in four lines, one platoon in each of the first three lines, and Company H.Q. with one Lewis gun in the fourth line. Each company had a covering party 150 yards to the front. D Company (in reserve) was formed in columns of half platoons and in two lines ; two platoons in the frontline, and one platoon and Company H.Q. in rear. Battalion H.Q. were at Double Cotts (Twin Cottages). At 5 a.m. (20th September) 2nd Lieut. Willes (Intelligence Officer) and 8 Scouts took up positions with D Company. 8 Scouts being sent to each of the three attacking, companies. Touch was obtained with the 12th R.B. on the right, but no touch could be got with the 59th Brigade on the left, and there was a gap of at least 150 yards between. 2nd Lieut. Willes laid out tapes on pegs already provided by the R.E., and led companies to assembly positions. Zero was 5.40 a.m. 20th September. It was then still dark, dawn just breaking. At 5.41 a.m. oil drums were discharged at Cemetery (U.14.C.0.0). These lit up the sky and showed my men to the enemy. As soon as the leading lines came over the ridge, into view of Eagle Trench, they came under heavy machine-gun fire from five concrete houses in the trench. B Company, on the right, caught the worst of this, and soon lost all their officers and most of their N.C.O.'s. C Company, in the centre, gallantly led by Captain Brooks and 2nd Lieut. Bevington, tried to get on, and were within 60 yards of the trench, when they were finally held up, Captain Brooks being killed on the German wire. 2nd Lieut. Bevington and three or four men succeeded in getting into the trench, but were wounded and could do no more. A Company got within 70 yards, and were then held up; Captain Skuce was mortally wounded. D Company tried to get forward to reinforce and push on, but were unable to do this, and at 6.30 a.m. all companies were in shell-holes west of Eagle Trench, digging in. It was impossible to get orderlies back to H.Q., and it was not until 7 a.m. that I learned the situation. The 59th Brigade, on the left, were held up on the same line, and the 12th R.B. on my immediate right. The situation remained thus during the day, all movement being under the observation of the enemy, who had snipers, on the look-out. A fresh attack was ordered for 5.30 p.m., the 6th K.S.L.I, to send one company to help to get on, and another to work round the right with the 12th R.B. I was able to send orders to D Company (Lieut. Cook), but I could not communicate with any other officer. At 5 p.m. the enemy put down a heavy barrage on the line U.23.d.l.4-U.29.b.2.9, but did not attack opposite me. At 6.30 p.m. our barrage came down on Eagle Trench, and Lieut. Cook collected all men near him, and, with2nd Lieut. Tapper, went forward. The enemy surrendered to him, and Lieut. Cook took a party and bombed along Eagle Trench, meeting with little opposition until about U.23.b.3.0.5, where his bombs gave out, and the enemy bombed him back. He then sent forward some riflemen to the right flank to hold the enemy, whilst he collected all German stick-bombs and formed a block in the trench, which he held. 2nd Lieut. Tapper, seeing that this attack was succeeding, pushed forward to Louis Farm, taking with him about 20men of B Company, under Sergeant Walker. Here they linked up with the 6th K.S.L.I. and the 12th R.B.A line of posts was then dug from Eagle Trench east, along the edge of the Cemetery, and south of the road to Louis Farm, with another line running east of the Cemetery back to Eagle Trench. I ordered 2nd Lieut. Tapper to withdraw from Louis Farm, and, with Lieut. Cook, to hold the Cemetery with D Company, B Company remaining at Louis Farm. A Company (2nd Lieut. Scogings) held the block in Eagle Trench. C Company was still west of the trench. GARRETT – Sept 21, in France, Private Alfred John Garrett, Oxford and Bucks Light Infantry, second son of Mr W Garrett, of 13 South View, King’s-road, Newbury, aged 35. He was buried in grave IV.H.33 at Bard Cottage Cemetery. For much of the First World war, the village of Boesinghe (now Boezinge) directly faced the German line across the Yser canal. Bard Cottage was a house a little set back from the line, close to a bridge called Bard's Causeway, and the cemetery was made nearby in a sheltered position under a high bank. 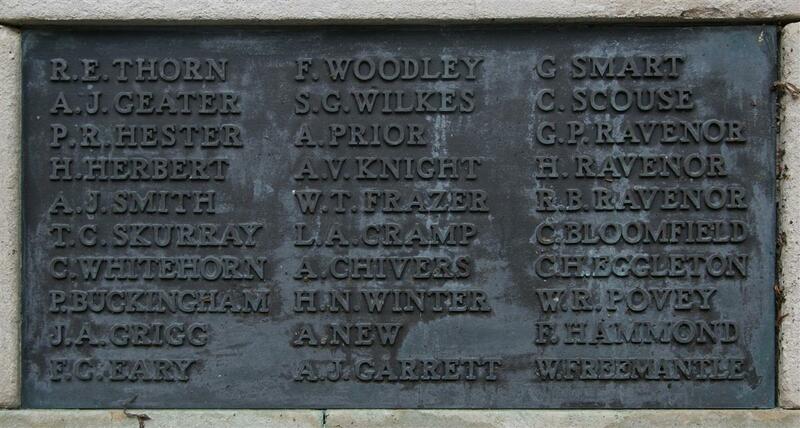 Locally he is remembered on tablet 12 of the Newbury Town War Memorial.